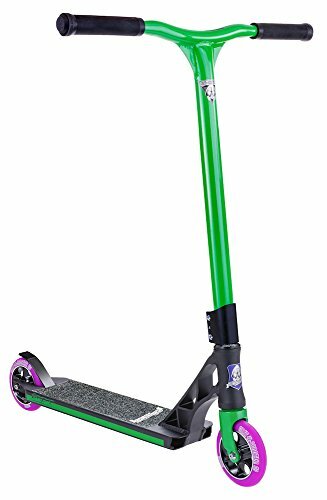 Grit Tremor Grom Pro Scooter (Black/Green) , selling for $250.00 brand new. Manufactured by Grit Scooters. There are 1 units left brand new. ntroducing for the first time the Grit Tremor Grom HIC Scooter. The Grit Tremor Grom has all the high quality specs of the Grit Tremor but scaled down for the smaller shredders out there. The Grit Tremor Grom has a 18.75″ length deck (vs 19.75″ for Tremor) and 20″ H x 21″ W (vs 22″ H x “22 W for Tremor). Stacked with HIC compression, Oversized Reinforced Riser Handlebars, 4.35” wide Fully Integrated Alloy Deck with 3 degrees of concavity and Integrated Grind Rails, and 110mm 88A Alloy Spoked Wheels with ABEC 9 bearings, the Grit Tremor Grom HIC Scooter has what it takes to excel on the street, at the park and everywhere in between.